Ross & Cromarty Roots | Gairloch Old Burial Ground. 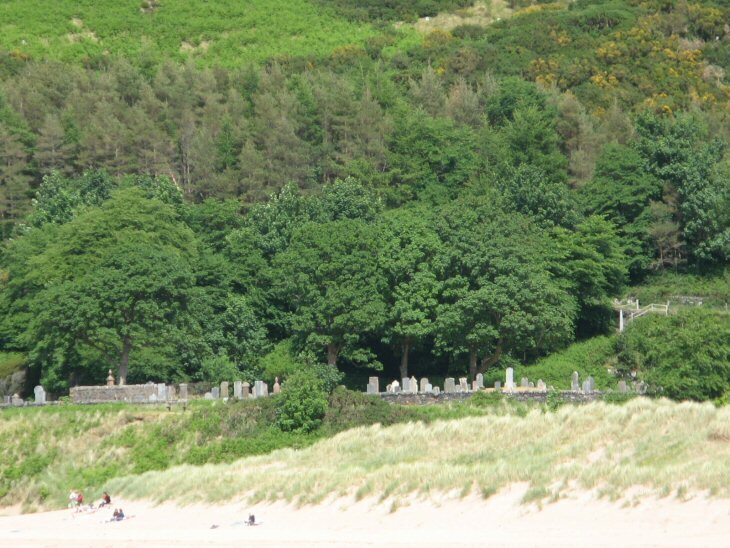 Located between road and beach, this beautiful burial ground has served the communities of Gairloch for a number of centuries. Picture Added on 13 June 2008. I am searching for my ancestors. Parents of Donald Ferguson McLennan born in Gairloch 1816. Not sure of their names but could be John and Christina or John and Catherine. Are you able to help me locate them or any one else connected to them. I would appreciate anything you might have as I have come to a stop. Added by Leonie Crane on 26 November 2010. Hi Leonie, I research all the McLennans from Gairloch. There is no record for a Donald Ferguson McLennan. However, I know of a Donald McLennan (relative of mine in fact) that emigrated to Australia, married Eliza Baker, and had a child named Donald Ferguson McLennan. Does that correspond to your line? If yes, then I do have info about those McLennans in Gairloch. Added by Francisco on 05 January 2012. Hi, I am currently researching my ancestors from Poolewe and Gairloch. I live in Australia, and its a very difficult task to get meaningful information over here. So any help whatsoever would be very much appreciated.. My ancestors are as follows. John McPherson, born and died Gairloch 1760-1851, and his wife, Jenny Jessie Mcpherson. I've no dates available for her. . And maternal lines are, Duncan Mackenzie and his wife was Anne. I have their daughter Christina Henderson Mackenzie Mcpherson, [my gt gt grandmother] born at Poolewe in 1806, so I presume that's where her parents were buried.. Any help at all would be great.. Regards, Jim..
Added by James McPherson on 19 January 2015. Added by Francisco on 22 January 2015. Hi Francisco, Pleased to make your acquaintance. Thank you very much for looking for me, I appreciate it greatly. I will take your results on board, as I can find nothing on them at all. I contacted the Gairloch heritage museum about all this. They have kindly offered to search the parish records for me, so fingers crossed, they will find further files. The holy grail for me is to find anything on Christina, my grt grt grandmother and her husband Donald, But even though they migrated here in 1839, there is next to no records of them anywhere, and that includes over here. Its almost like they didn't exist. They were early pioneers in rural N.S.W., And as I know the town where they moved, the historical society in that town is hot on my list of places to visit as soon as I can.. Once again, thank you very much, your information is a blessing to me.. And I must add, you people over there are very helpful and friendly..
Added by James McPherson on 23 January 2015. Added by Kaye on 26 February 2015. Added by Carol McLennan Mohr on 17 June 2015. I too, like Kaye who left a message here on 26 Feb 2015, am interested in any McGregor (all spelling variations) in the Gairloch Parish pre 1825 (especially Poolewe, Inverewe, Kernsary, Isle of Ewe). The couple she mentioned (Donald McGregor and Mary McRae) are my 3rd great grandparents. Best wishes to all researchers - from Jeannine in 'Down Under' Australia. Added by Jeannine (nee McGregor) on 27 July 2015.